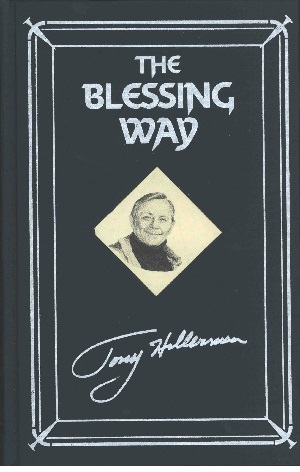 This is the commemorative edition of The Blessing Way, published by The Armchair Detective Library in New York City, NY. This hardcover edition was issued in 1990 as part of the Armchair Detective Library series with a special 2 page introduction written by Tony Hillerman. In addition to the commemorative edition, a standard commercial edition and a limited run collectors edition were also produced. This commemorative edition is bound in navy blue cloth with silver lettering on the spine and a sepia tone portrait photograph of Tony Hillerman on the front cover. No dust jacket was issued for this version. Binding: Navy blue boards with silver lettering and a sepia toned picture on cover. The title, author, and publisher are printed in silver lettering on the spine.